With so many neighborhoods in La Coruna, like Santiago De Compostela, worth exploring, you will want your own ride to check out all there is to do here. Buses or metro, while cheap, may not drop you off right where you need to go. Ride hailing, like Uber or Lyft, is convenient, but smaller towns may not have timely service. Plus, if you plan to go all over Santiago De Compostela and the surrounding areas, the cost can add up. If you want convenience for an affordable rate, then you are in the right spot. Thrifty is one of the many great rental car dealers we work with to not only get you the vehicle you need for your future holiday, but also get you the best price. 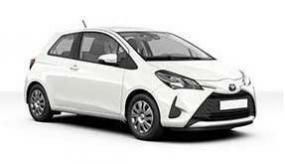 How do I get the best rates on a Santiago De Compostela Thrifty car rental? What documents do I need when I get my car in Santiago De Compostela? Thrifty's minimum age to rent a car is 21. Take time to check Thrifty's policy, as there may be limitations if you are under 25 or for larger or higher category vehicles especially. Is there a particular car I should book for my trip to Santiago De Compostela? Does Santiago De Compostela require car insurance? When driving in Santiago De Compostela or the rest of country, you will need insurance. Thrifty requires that you show proof of insurance before you rent a car. Almost all countries require the driver to have insurance. You may be able to pay for interim insurance with Thrifty. The major credit cards (MasterCard, Visa, American Express and Discover) will usually provide some coverage. But many of them have restrictions, such as not covering larger vehicles like trucks or SUVs. It is best to call and find out what kind of coverage is offered before you head to La Coruna. Thrifty, like several other rental car companies, requires a deposit when you make your reservation. The amount can vary greatly depending on the type of vehicle. Furthermore, be sure there is enough available on your credit card to cover a deposit. At CarRentals.com, we encourage a full tank policy. You should get into your automobile with the needle at "F". If you return the rental with less than the amount you received it with, most companies will charge a premium, and sometimes up to triple the amount of current gas prices to refill it. To avoid any added expenses, it is best to fill up your tank before returning the rental to Thrifty. Stations close to airports or car rental places tend to have higher prices. Why should I get unlimited miles in Santiago De Compostela? Many suppliers provide unlimited miles, but you want to make sure it is part of your bundle. It's helpful to know how far you want to drive so you can plan your trip in advance. Although most car rental companies offer unlimited mileage, if it isn't part of your rental agreement, you could face additional cost. You may want unlimited miles if you are imagining some road trips to discover what else is in La Coruna. With so much to do and see in La Coruna, having access to a vehicle lets you sightsee at your own pace. When you're ready to see more of Spain, you can drive wherever you like, without having to coordinate a rideshare or wait for the bus. Heading out of town soon? Book your Thrifty Santiago De Compostela car rental and drive to all the must-see sights. Reserve through CarRentals.com and hit the streets in La Coruna, Spain.